1957 and from 1961 to 1965. I also owned a 12' Dinghy: she was called "Lina" and the sail number was "I-68". She was a gift from my father at the end of my school season in 1934. This was my introduction to sailing. With her I learned my first sailing skills under the keen supervision of "Rafele o' ciato" (real name Raffaele D'Esposito), then captain of the yellow and red flagged sailing club at Malosiglio. The hull, built with perfect wooden planking by Basilio Postiglione in his Posillipo boatyard, was red with a yellow waterline to represent the colours of the Circolo Canottieri Napoli. In that time the Neapolitan gulf was home to numerous dinghies which were sailed daily. 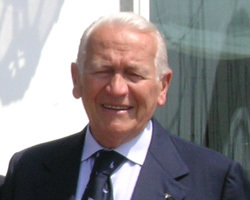 The place was the source of many great champions, firstly, Guido Postiglione, then Massimo Murolo, Nino Cosentino, Gennaro De Luca, Alfredo d'Angelo, Eugenio Masciocchi, Alfredo Montuori, Giancarlo Cosentino, Pasquale De Maria, and finally Gaetano Pesce, each of whom rose to the highest level in sailing. The Twelve is without doubt a great boat. Her British origins, - England was then the home of International Yachting - shows in her incredible marine qualities which, still today - over ninety years after her birth - explain her large and significant diffusion in the world. Easy to carry on a car trailer, she is also built in GRP to high safety standards. Suitable for every category of sailor, young or old, every year the Dinghy is successfully sailed by her numerous fans in both national and international events. This is the strength of the Class which, through her national associations, is capable of promoting highly competitive racing events. It was a great pleasure when Fabrizio [Cusin] introduced me to the 12' dinghy. I liked both his GRP and his wooden boat. The wooden one evoked extraordinary memories of the time when, in another wooden dinghy, I was training for the conquest of my first Olympic medal in the Finn class. I recalled the sound of the water on the hull, which gave me an incredible sense of well-being. 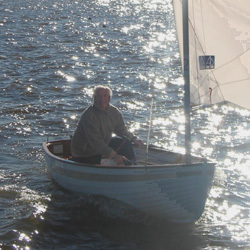 I raced the dinghy: a difficult, technical, but safe boat; suitable for beginners and both young and old; but also suitable for those professionals wishing to improve their sailing skills. Not too biased towards windward sailing and not too unstable, even in strong winds. The fact that she is not a very fast boat is also an advantage allowing her crews to better develop their tactical racing skills. Dinghy sailors are friendly and charming, as is this marvellous boat. Long live the 12' dinghy.